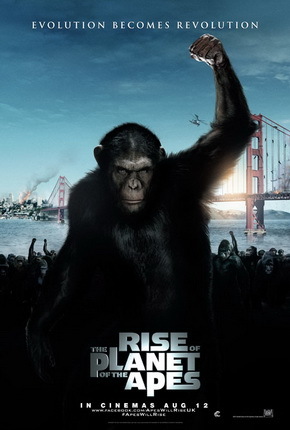 “RISE OF THE PLANET OF THE APES combines fantastic storytelling with the next leap in Visual Effects for an emotional and action-packed motion picture experience unlike any other. Man’s arrogance sets off a chain of events that leads to intelligence in apes and a challenge to our place as the dominant species on the planet. Caesar, the first intelligent ape, is betrayed by humans and rises up to lead his species’ spectacular race to freedom and the ultimate showdown with Man. In Caesar, WETA – the Oscar-winning visual effects team behind Avatar – have created a CGI ape that delivers a dramatic performance of unprecedented emotion and intelligence” (20th Century Fox). Verdict: Surprisingly impressive. Initially after watching the trailer, I thought it was going to be yet another lame spin off of the original Planet of the Apes but it turned out to be one of the best films of the year to me. Incredible performance by Andy Serkis (Smeagol/Gollum in The Lord of the Rings movie franchise) as Caesar, the chimpanzee, that was convincingly animated with the help of the latest filming technology. Director Rupert Wyatt is also commendable for being able to deliver despite having very little big-budget directing experience. However, the dialogue-writing could be better and I’m sick of James Franco’s acting. Mid-credit scene: Very essential to reveal how human population is reduced in the timeline of the original Planet of the Apes. Second opinion: “It’s good. I almost cried at one of the scenes!” (Iris Loong). yup, i agree. 4/5 star. Its nice eh? Was wondering if i shud watch it…. ooo, haven't watched. Its that good hor.